Methods The randomised controlled trials of initiation of β-blockers before non-cardiac surgery were examined. Primary outcome was all-cause mortality at 30 days or at discharge. The DECREASE trials were separately analysed. Results Nine secure trials totalling 10 529 patients, 291 of whom died, met the criteria. Initiation of a course of β-blockers before surgery caused a 27% risk increase in 30-day all-cause mortality (p=0.04). The DECREASE family of studies substantially contradict the meta-analysis of the secure trials on the effect of mortality (p=0.05 for divergence). In the secure trials, β-blockade reduced non-fatal myocardial infarction (RR 0.73, p=0.001) but increased stroke (RR 1.73, p=0.05) and hypotension (RR 1.51, p<0.00001). These results were dominated by one large trial. Conclusions Guideline bodies should retract their recommendations based on fictitious data without further delay. This should not be blocked by dispute over allocation of blame. The well-conducted trials indicate a statistically significant 27% increase in mortality from the initiation of perioperative β-blockade that guidelines currently recommend. Any remaining enthusiasts might best channel their energy into a further randomised trial which should be designed carefully and conducted honestly. ‘… [those] scheduled for intermediate-risk surgery’. The joint guidelines produced by the American College of Cardiology Foundation and the American Heart Association (ACCF/AHA) also endorse perioperative β-blockade in patients undergoing vascular or intermediate-risk surgery with coronary artery disease (CAD), or with more than one risk factor for CAD, or with pre-existing β-blockade (table 1). The principal evidence for mortality benefit has been the Dutch Echocardiographic Cardiac Risk Evaluation Applying Stress Echocardiography (DECREASE)2 family of studies which were discredited almost 2 years ago3 and subsequently underwent lengthy internal investigation, the results of which have been public for some time.4 Nevertheless, neither the European Society of Cardiology (ESC) nor the AHA guidelines have been retracted. All studies investigated in the DECREASE family for which data had not been lost were found to be insecure because of serious flaws (table 2). In one case it was clear that the entire study dataset had been fabricated. DECREASE I,5 published in 1999, escaped investigation as the terms of the investigation only reached back 10 years. We therefore conducted a meta-analysis of the remaining secure intention-to-treat randomised controlled trial (RCT) data on the initiation of a course of β-blockade for the prevention of all-cause mortality and other secondary endpoints in the perioperative period for patients undergoing non-cardiac surgery. We included published RCTs that compared the initiation of a course of β-blocker therapy in the preoperative period with placebo in adults undergoing non-cardiac surgery. There were no language restrictions. We searched Medline (1966 to 1 April 2013), the Cochrane Central Register of Randomised Controlled Trials, the WHO International Clinical Trials Registry Platform Search Portal (http://apps.who.int/trialsearch/), Excerpta Medica Database (EMBASE) and the Cumulative Index to Nursing and Allied Health Literature (CINAHL) using the search terms available in the online supplement on 23 March 2013 (see online supplementary appendix 1). We also hand-searched previous reviews and meta-analyses for other studies. We excluded non-randomised studies, studies comparing β-blockers with another treatment, studies using a one-off dose preoperatively rather than a course of β-blockers extending into the postoperative period and studies which did not report intention-to-treat data. The primary endpoint was all-cause mortality from the date of randomisation without excluding the in-hospital postoperative window. The time point was 30 days or, if this was not available, until hospital discharge. The secondary endpoints were non-fatal myocardial infarction (MI), stroke and hypotension. Data extraction was performed in duplicate by MJS and SB with any disagreements resolved by DPF. We performed the meta-analysis excluding studies from the DECREASE family because every study in it that had enough documentation to be investigated was found to be insecure (table 2). All studies were assessed for quality using the Cochrane ‘risk of bias’ tool9 which considers the risk of selection, performance, detection, attrition and reporting bias. Publication bias was assessed using a funnel plot. We identified 300 publications; 265 were initially found on PubMed (see online supplementary appendix 2), 3 from the Cochrane Central Register of Randomised Controlled Trials, 19 from the CINAHL, 1 from EMBASE and 12 via hand searching of references. 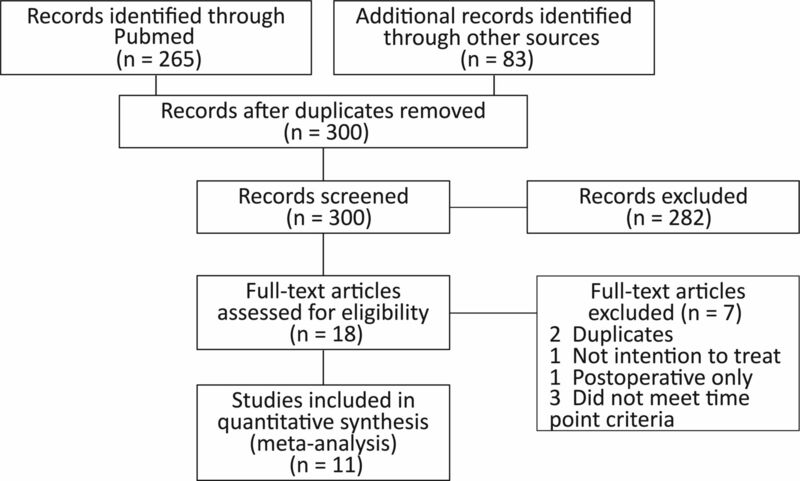 A total of 282 were excluded after reading the abstract (of which 39 received premedication only) and a further seven were excluded after reading the full text for the following reasons: two were duplicates of other studies,10 ,11 one could not be included because 10 patients were excluded after randomisation including one who had pulmonary oedema in the metoprolol arm,12 three did not meet the time point criteria of 30 days or until discharge,13–15 and one initiated the β-blockade postoperatively16 (see online supplementary appendix 2). A total of 11 RCTs met the eligibility criteria (figure 1), of which two were from the DECREASE family (DECREASE I and DECREASE IV5 ,17). Source of studies considered for inclusion. The risk of bias is shown in table 4. Publication bias was assessed using a funnel plot (see online supplementary appendix 4) which did not show significant asymmetry, but this cannot definitively exclude publication bias. In total there were 10 529 patients in nine secure trials, with 162 deaths in 5264 patients randomised to β-blockers and 129 deaths in 5265 patients randomised to placebo. In the nine secure studies, β-blockers caused a statistically and clinically significant increase in mortality of 27% (RR 1.27, 95% CI 1.01% to 1.60%, p=0.04). There was little heterogeneity between studies (I2=0%, p=0.68; figure 2). Meta-analysis of nine secure randomised controlled trials showing a significant increase in mortality with perioperative β-blockade. We conducted a separate meta-analysis of the two insecure studies (figure 3). These show a consensus effect of a non-statistically significant decrease in mortality by more than half (RR 0.42, 95% CI 0.15 to 1.23, p=0.11). There was moderate heterogeneity between the two studies (I2=44%, p=0.18). Studies in the DECREASE family have been shown to have been composed of fictitious data, have fabricated endpoints, missing data and patient records and are now discredited. The contrast between the secure and the DECREASE studies was statistically significant (p=0.05, figure 4). Difference in the estimate of effect size between secure and non-secure studies. Six secure trials provided data for MI; β-blockade was reported to reduce non-fatal MI (RR 0.73, 95% CI 0.61 to 0.88, p=0.001). The DECREASE studies also reported a reduction (RR 0.21, 95% CI 0.03 to 1.61, p=0.13), with no significant contrast between the secure and the DECREASE studies (p=0.23, figure 5). Comparison of effect of perioperative β-blockade on non-fatal myocardial infarction in secure and non-secure trials. Six secure studies provided data for stroke; β-blockers significantly increased stroke (RR 1.73, 95% CI 1.00 to 2.99, p=0.05). DECREASE I reported stroke (RR 1.33, 95% CI 0.30 to 5.93, p=0.71), which was not significantly different from the secure studies (p=0.75, figure 6). Comparison of effect of perioperative β-blockade on non-fatal strokes in secure and non-secure trials. Six secure studies reported hypotension, which occurred more frequently in the β-blocker group than in the control group (15.2% vs 10.0%, RR 1.51, 95% CI 1.37 to 1.67, p<0.00001, figure 7). Prevalence of hypotension in β-blocker and control groups. Note: In the MaVS trial the intraoperative hypotension rate is reported. The initiation of a course of β-blockers preoperatively in patients undergoing non-cardiac surgery increases mortality by 27%, which is both statistically and clinically significant. DECREASE trials I and IV report findings inconsistent with the intention-to-treat results of secure RCTs on the initiation of β-blockers on perioperative all-cause mortality. Although β-blockers reduce non-fatal MI, they also increase hypotension and stroke. It is conceivable that an increase in death due to hypotension or stroke was overcoming a reduction in death from MI, leaving a net increase in deaths. However, there are insufficient quantitative data on the subclasses of death to be certain: deaths are relatively few and difficult to classify reliably by cause. Cardiologists might also hope that the 100 mg dose that increased mortality in the POISE trial might have been excessive and that commoner dosages such as metoprolol 25 mg three times a day instead might be beneficial rather than harmful. However, the higher headline value of 100 mg in the POISE trial is of metoprolol CR/XL which is a slow-release once-daily preparation with a bioavailability 25–30% lower than that of standard metoprolol.26 ,27 Thus, the dosage of 100 mg CR/XL in the POISE trial is equivalent to the 75 mg/day that accrues with 25 mg three times a day of immediate-release metoprolol, whose initiation cardiologists might consider conventional. The POISE trial was therefore not high-dose. Within the ESC guidelines and associated meta-analysis, the inclusion of non-secure data caused them to reach a conclusion that β-blockers had a neutral effect on mortality and allowed them to focus on the reduction of non-fatal MI as a surrogate endpoint. This resulted in β-blockers receiving a class I/IIa recommendation, despite secure trials indicating that they increase mortality. The β-blocker section of the 2009 ESC Guidelines for Perioperative Cardiac Risk Assessment and Management1 requires reconsideration; without the DECREASE studies the profound adverse findings of the large POISE trial are the dominant contributor. The POISE trial had a protocol of initiating a dose considered by some to be high (100 mg extended-release metoprolol) shortly (2–4 h) before surgery. This has been argued to be unrepresentative of clinical practice, but not been borne out by surveys of practice28 and is similar to the total daily metoprolol dose from other regimens such as 25 mg three times a day which might not be considered dramatic. Nevertheless, POISE-like regimes now have no reason for continuance. If the appropriateness of the POISE protocol is doubted, then the remaining secure data are not sufficient to guide physicians either way. In the present analysis the RR of mortality from randomisation to β-blockade for non-cardiac surgery is 1.27 (95% CI 1.01 to 1.60) or, conversely, randomisation to not having β-blockade has a RR of 0.79 (95% CI 0.63 to 0.99), indicating a 21% reduction. In the UK,31 for example, almost 2.5 million high- or intermediate-risk procedures are performed per year, with deaths at 30 days totalling 47 286. Refraining from this ESC guideline1 would therefore be expected32 to prevent up to 10 000 iatrogenic deaths each year in the UK. Could we have found this earlier? Any one of three considerations might have opened this opportunity earlier. 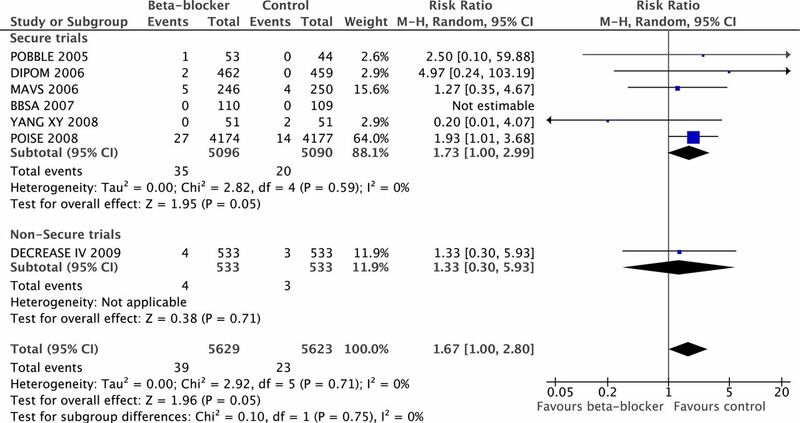 First, with a strong pointer in 2008 that the introduction of β-blockers before surgery increases mortality, we could have avoided the siren call of reduction in non-fatal MI. If a patient succumbs after intervention, knowing that he or she was prevented from having a MI is no consolation. Second, we could have realised that not all trial data are of equal reliability. The POISE21 investigators prominently carried out anti-bias steps including record-keeping and scrutiny for anomalies which were acted on. For example, they flew to Colombia and Iran to investigate suspicious returns, resulting in invalidation of data from one centre in Colombia and the entire dataset for Iran. Third, we could have acted on a 2008 meta-analysis33 flagging DECREASE I to be at high risk of bias 4 years before the DECREASE family was formally declared insecure. Could DECREASE I have been valid? There is no proof that the DECREASE I5 study was unreliable.34 ,35 No investigation has been conducted, nor is one on the horizon. Data storage appeared to be haphazard for the DECREASE family of studies.4 Of the five investigated DECREASE studies, the only one for which raw data existed was DECREASE VI, but the investigation concluded that this was ‘fictitious data’. Even for recent studies such as DECREASE V, not a single case record form (CRF) could be found in any location for the 101 patients. In DECREASE IV the key data required to judge outcomes were missing and the adjudication committee was fabricated. A review of the hospital computer information system found that ‘in a large number of cases a myocardial infarct which the researchers had recorded could not be confirmed’ in the hospital records. DECREASE III could not be investigated as all the source documentation was lacking. For DECREASE II only half the CRFs were found and study outcomes were again realised not to have been assessed as described in the publication. The investigation did not attempt to evaluate the distant DECREASE I. All we know is that the later DECREASE family of studies fell far short of the standards assumed by clinical readers. There are two hypotheses. The first is that standards started high in the uninvestigated DECREASE I and then declined subsequently as more experience was gained as an international perioperative clinical research centre, ultimately reaching the depths of the entirely fictitious DECREASE VI. The alternative hypothesis is that that honesty was low throughout. While there was minimal evidence that heterogeneity was assessed by Cochrane's I2 among the secure trials, this measure may be low powered to detect such a difference. In addition to vascular surgery, the studies included a wide range of surgeries including abdominal, orthopaedic, urological, gynaecological and plastic surgery, among others. It may therefore be difficult to see if the initiation of a course of β-blockers before surgery in certain patient groups is beneficial. The meta-analysis is heavily influenced by the POISE trial.21 However, this is appropriate because the POISE trial is by far the largest study and it was well conducted. Without it there is little remaining evidence base. A statistically significant increase in all-cause mortality has overwhelming clinical significance which cannot be compensated for by a simultaneous reduction in non-fatal events. The use non-fatal MI as a surrogate for death therefore may not be valid for perioperative β-blockade. Patient safety being paramount, guidelines for perioperative β-blocker initiation should be retracted without further delay. Future guidelines should be accompanied by a commitment from named individuals to retract them immediately if the advice given is later revealed to be harmful. Routine initiation of β-blockers for this indication should not be recommended, except in the context of RCTs which should be designed carefully, conducted honestly and reported truthfully. Task Force for Preoperative Cardiac Risk Assessment and Perioperative Cardiac Management in Non-cardiac Surgery, European Society of Cardiology (ESC); Poldermans D, Bax JJ, Boersma E, et al. Guidelines for pre-operative cardiac risk assessment and perioperative cardiac management in non-cardiac surgery: . Eur Heart J 2009;30:2769–812.
. Reducing cardiac risk in non-cardiac surgery: evidence from the DECREASE studies. Eur Heart J Suppl 2009; 11:A9–A14. Erasmus Medical Centre. Investigation into possible violation of scientific integrity. 2011. http://www.erasmusmc.nl/5663/135857/3664573/3397899/report_summary_investigation_integrity (accessed 10 Jul 2013). Erasmus Medical Centre. Report on the 2012 follow-up investigation of possible breaches of academic integrity. 2012. http://cardiobrief.files.wordpress.com/2012/10/integrity-report-2012-10-english-translation.pdf (accessed 10 Jul 2013).
. The effect of bisoprolol on perioperative mortality and myocardial infarction in high-risk patients undergoing vascular surgery. Dutch Echocardiographic Cardiac Risk Evaluation Applying Stress Echocardiography Study Group. N Engl J Med 1999;341:1789–94. European Society of Cardiology. Dismissal of Professor Don Poldermans from the Erasmus Medical Center (NL). http://www.escardio.org/about/press/press-releases/pr-11/Pages/Dismissal-Don-Poldermans.aspx (accessed 10 Jul 2013). Review Manager (RevMan). Version 5.0. Copenhagen: The Nordic Cochrane Centre, The Cochrane Collaboration, 2008.
. The Cochrane Collaboration's tool for assessing risk of bias in randomised trials. BMJ 2011;343:d5928.
. Prophylactic atenolol reduces postoperative myocardial ischemia. McSPI Research Group. Anesthesiology 1998;88:7–17.
. CAGS and ACS Evidence Based Reviews in Surgery. 34: Effects of β-blockers in patients undergoing noncardiac surgery. Can J Surg 2010;53:342–4.
. Perioperative metoprolol reduces the frequency of atrial fibrillation after thoracotomy for lung resection. J Cardiothorac Vasc Anesth 1997;11:746–51.
. [Beneficial effects of metoprolol on perioperative cardiac function of elderly esophageal cancer patients]. Ai Zheng 2006;25:609–13.
. Beneficial effects from beta-adrenergic blockade in elderly patients undergoing noncardiac surgery. Anesthesiology 1999;91:1674–86.
. The effect of heart rate control on myocardial ischemia among high-risk patients after vascular surgery. Anesth Analg 1999;88:477–82.
. Postoperative prophylactic administration of beta-adrenergic blockers in patients at risk for myocardial ischemia. Anesth Analg 2000;90:1257–61.
. Bisoprolol and fluvastatin for the reduction of perioperative cardiac mortality and myocardial infarction in intermediate-risk patients undergoing noncardiovascular surgery. Ann Surg 2009;249:921–6. POBBLE Trial Investigators. Perioperative β-blockade (Pobble) for patients undergoing infrarenal vascular surgery: results of a randomized double-blind controlled trial. J Vasc Surg 2005;41:602–9.
. Effect of perioperative beta blockade in patients with diabetes undergoing major non-cardiac surgery: randomised placebo controlled, blinded multicentre trial. BMJ 2006;332:1482.
. The effects of perioperative β-blockade: results of the Metoprolol after Vascular Surgery (MaVS) study, a randomized controlled trial. Am Heart J 2006;152:983–90.
. Effects of extended-release metoprolol succinate in patients undergoing non-cardiac surgery (POISE trial): a randomised controlled trial. Lancet 2008;371:1839–47.
. [Effects of metoprolol on perioperative cardiovascular events in patients with risk or at high risk for coronary artery disease undergoing non-cardiac surgery]. Zhonghua Yi Xue Za Zhi 2008;88:1476–80.
. Effect of atenolol on mortality and cardiovascular morbidity after noncardiac surgery. Multicenter Study of Perioperative Ischemia Research Group. N Engl J Med 1996;335:1713–20.
. Lessons learned from a randomised controlled study of perioperative beta blockade in high risk patients undergoing emergency surgery. The Surgeon 2006;4:139–43.
. Propranolol for the prevention of postoperative arrhythmias in general thoracic surgery. Ann Thorac Surg 1999;67:182–6.
. Pharmacokinetic and biopharmaceutic aspects of once daily treatment with metoprolol CR/ZOK: a review article. J Clin Pharmacol 1990;30:S2–16.
. Steady-state bioavailability and day-to-day variability of a multiple-unit (CR/ZOK) and a single-unit (OROS) delivery system of metoprolol after once-daily dosing. Pharm Res 1993;10:28–34.
. Knowledge and practice regarding prophylactic perioperative beta blockade in patients undergoing noncardiac surgery: a survey of Canadian anesthesiologists. Anesth Analg 2003;96:1558–65.
. Perioperative beta-blocker therapy and mortality after major noncardiac surgery. N Engl J Med 2005;353:349–61.
. 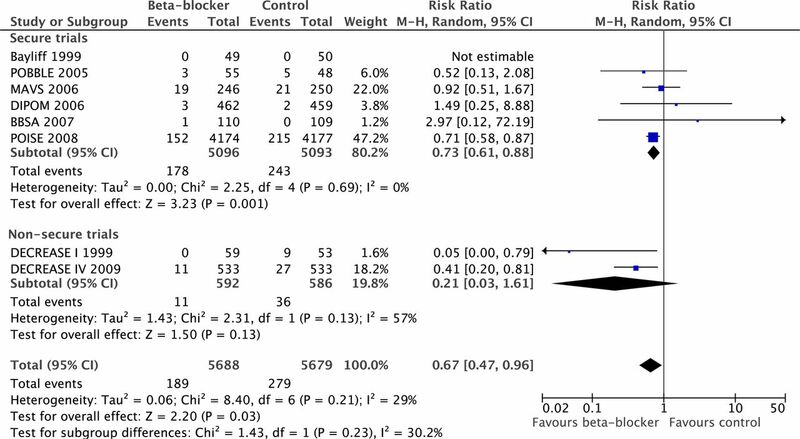 The experts debate: perioperative beta-blockade for noncardiac surgery—proven safe or not? Cleve Clin J Med 2009;76(Suppl 4):S84–92. http://www.hscic.gov.uk/article/2677/Linked-HES-ONS-mortality-data. (Access date 20th July 2013).
. Fluvastatin and bisoprolol for the reduction of perioperative cardiac mortality and morbidity in high-risk patients undergoing non-cardiac surgery: rationale and design of the DECREASE-IV study. Am Heart J 2004;148:1047–52.
. Perioperative β blockers in patients having non-cardiac surgery: a meta-analysis. Lancet 2008;372:1962–76.
. Perioperative mischief: the price of academic misconduct. Am J Med 2012;125:953–5.
. Scientific fraud or a rush to judgment? Am J Med 2013;126:e5–6. Contributors SB, MJS and DPF conceived the study, had full access to all the data in the study and take responsibility for the integrity of the data and the accuracy of the data analysis. SB is the guarantor. SB, MJS, GC, JM and DPF drafted and revised the manuscript. Funding DPF is supported by the British Heart Foundation (FS/10/038).